Wipeout is the Most Exciting Slide Wet or Dry! Description: This is our biggest slide. 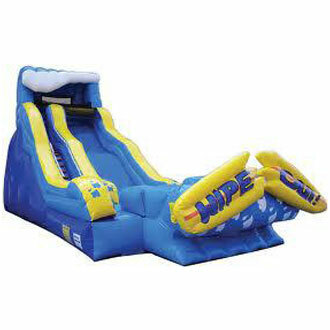 It can be used as a simple inflatable slide or as a water slide. It is 19ft high x 14ft wide x 36ft long. Looking to add excitement to your next event, look no further and book this impressive slide. We have affordable bounce houses and water slides for rent. Our inflatables are cleaned and sanitized after every rental. We are fully insured and inspected by the state of New Jersey. Call 862-238-9299 to reserve. Don't forget Like us on facebook to receive 5% off your next rental. 36ft Long x 14ft wide x 19ft high. Requires a setup area of 45ft long x 18ft wide.